older leaves are best when boiled in 1-2 changes of water with pinch of baking soda. roots of first year plants can be cooked in a soup or stir-fry. roots can be mashed and fried as patties. roots can be roasted/ground as coffee substitute. roots are best when shredded/sliced and soaked in water for 5-10 minutes to reduce harshness. white pith of young flower stalks is edible raw. varieties in Ontario are Great burdock (Arctium lappa), Common burdock (Arctium minus) and Woolly burdock (Arctium tomentosum). look for burdock on disturbed soil sites. do not confuse with Cocklebur (Xanthium strumarium), who's leaves are poisonous if not thoroughly cooked. Cocklbur has rough rather than velvety leaves and has more solid burs. 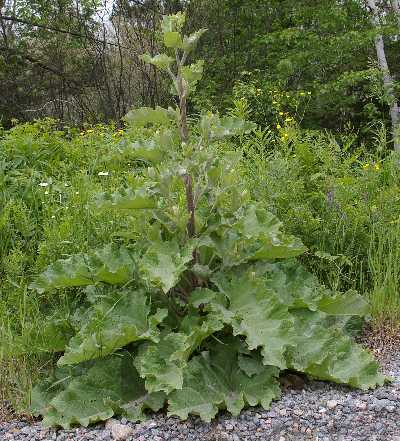 The main appeal of burdock for me is the abundance of large, substantive leaves which are easy to collect. The leaves are wavy on the edges and the underside is whitish, felty and has large, distinctive veins that look like those on your hand. The purple flowers on older plants are also a give-away. The plants that I've sampled have been too bitter to enjoy eating raw, and remained somewhat bitter even after boiling in a change of water. I've only used burdock leaves in my dinner soup when adding other ingredients to offset/mask its slightly unpleasant flavour. To their advantage, the leaves don't shrivel away into nothingness when boiled, as thinner leaves of other plants tend to do.